The House of Telephus in Herculaneum. The House of Telephus contains a first century relief depicting the myth of Achilles and Telephus, after which it is named. 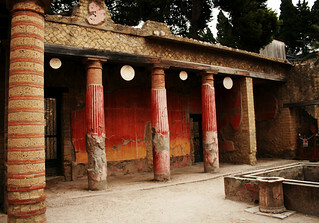 Herculaneum (Ercolano) was the second town destroyed by the eruption of Mount Vesuvius in 79AD. Not as famous as its near-neighbour Pompeii, the site is much smaller and more compact, but in parts better preserved by the ash and mud which swamped it. The site is located just eight miles from Naples and is almost lost amid the run-down modern residential neighbourhood in which it is located. An exclusive residential settlement at the time of the eruption, the site contains many brilliantly preserved homes, shops and baths which were used by the approximate 5,000 residents.